Besides convenience, a chief factor fuelling the uptake of smart home products is their assistance in energy management. Smart home as a service solutions not only enable users manage entertainment and other electronic appliances remotely, they also help customers keep a tab on the energy consumption. In addition, the rising demand for advanced security and surveillance has created an environment supporting strong growth of the global smart home as a service market. Because of opportunities it exhibits, the smart home as a service market has been attracting new players. While this pose threat to the existing companies, it also paves way for innovations and upgrade of existing technologies. On the flip side, the high cost of smart home products is inhibiting the market’s trajectory to an extent. Furthermore, privacy concerns and possibility of misusing the technology have made customers skeptical of deploying smart home solutions. Nevertheless, the advent of novel connectivity standards is expected to help the market players mitigate the aforementioned concerns in the coming years. The global smart home as a service market is forecast to reach US$10.9 bn by the end of 2025. In 2016, the market’s valuation stood at US$2.46 bn. If these figures hold true, the global smart home as a service market will exhibit an impressive CAGR of 18.1% between 2017 and 2025. On the basis of service, the global smart home as a service market is bifurcated into managed and integrated. The integrated service segment is anticipated to contribute major share in the global smart home as a service market. It is expected to hold nearly 63.6% of the market by the end of 2017. With the increasing demand and adoption of integrated services, the integrated services segment is likely to witness steady growth and thus remain dominant throughout the forecast period. The managed service segment is expected to hold a comparatively smaller share of the global smart home as a service market. On the basis of solution, the global smart home as a service market is segmented into security and access, lighting and window, audio-visual and entertainment, energy management and climate and integrated solutions. Of these, the integrated solutions segment is expected to hold the major share of the smart home as a service market. Security and access solution segment will emerge as the second-lead in terms of market share. Audio-visual and entertainment is projected to beat other segments in terms of growth pace. The segment is forecast to exhibit a CAGR of 19.67% during the period from 2017 to 2025. This growth is primarily ascribable to increased demand for streaming services and online content. The global smart home as a service market is expected to be led by North America. The region’s share in the market is expected to reach over 45% by the end of 2017, with the U.S. at the fore. Besides being an early adopted of advanced technologies, the North America market is gaining from the presence of several leading players in the region. Europe in 2016, has emerged as the second-leading market for smart home as a service in the world. In the region, France, Germany, and the U.K., have emerged as the most lucrative pockets. Moreover, Europe’s local industry exhibits a strong growth and overall consumers are aware of the latest technologies. These factors are expected to act in favor of the market in Europe. Through the course of the forecast period, Asia Pacific is forecast to exhibit highly lucrative opportunities. The market players are likely to capitalize on the rising demand from China, Japan, Australia, and South East Asian countries. The key players profiled in the global smart home as a service market include AT&T Inc., CenturyLink, Inc., Charter Communications (TWC), Comcast Corporation, Frontpoint Security Solutions, Ingersoll-Rand plc (Nexia), Johnson Controls, Inc., Protection One Alarm Monitoring, Inc., The ADT Corporation and Vivint, Inc. This report on the global smart home as a service market provides analysis for the period 2015–2025, wherein 2016 is the base year and the period from 2017 to 2025 is the forecast period. Data for 2015 has been included as historical information. 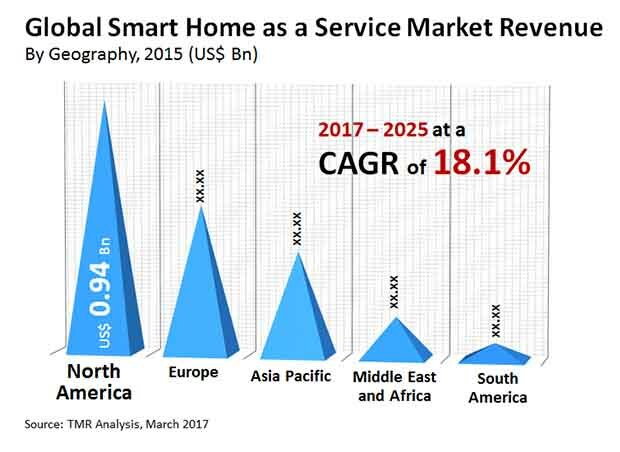 The report covers market dynamics including drivers, restraints opportunities, and trends expected to influence the global smart home as a service market growth during the said period. Technologies that are playing a major role in driving the global smart home as a service market have also been covered in the study. The study provides a comprehensive analysis on market growth throughout the above forecast period in terms of value estimates (in US$ Bn), across different geographies. The report also includes key developments in the smart home as a service market. Porter Five Force analysis is also included in the report. The report also covers segment wise comparison matrix, market attractiveness analysis and market share analysis for all regions covered in the scope of study. Comparison matrix includes segment growth matrix, 2015 - 2025 (%), segment value share contribution, 2015 - 2025 (%), and segment compounded growth matrix (CAGR %). Market attractiveness identifies and compares segments market attractiveness on the basis of CAGR and market share index. The report also includes competition landscape which include competition matrix, market share analysis of major players in the global smart home as a service market based on their projected value share, and business profiling of major players. The Competition Matrix benchmarks leading players on the basis of their capabilities and potential to grow. Factors including market position, offerings and R&D focus are attributed to company’s capabilities. Factors including top line growth, market share, segment growth, infrastructure facilities and future outlook are attributed to company’s potential to grow. This section also identifies and includes various recent developments carried out by the leading players. The smart home as a service market has been segmented on the basis of service, solution and geography. Based on service, the market has been divided into managed and integrated. Based on the solution, the market has been divided into security & access, lighting & window, audio-visual & entertainment, energy management & climate and integrated solution. The Managed Service can be defined as the proactive management of the smart home as a service solutions by a third party, on behalf of the customer whereas The Integrated Service can be defined as services that specify the constituents of the smart home as a service solution to guarantee quality of service on networks. Visual and Entertainment solutions refer to home entertainment and entertainment on demand. These solutions include smart and connected TVs, VR sets, streaming services, speakers, home theatre systems etc. Energy Management and Climate allow open communication between house utilities and the consumer. These solutions include smart meters, thermostats, energy usage monitoring kits etc. Integrated solutions include all-in-one solutions such as security kits, home monitoring kits, smart lighting kits etc. Geographically, the report classifies the global smart home as a service market into North America, Europe, Asia Pacific, Middle East & Africa (MEA), and South America; the regions are analyzed in terms of market revenue. Furthermore, region wise prominent countries covered in the report include the following - the U.S, Canada, Germany, France, the U.K., China, Japan, Australia, UAE, Saudi Arabia, Brazil and Argentina. Company profiling includes company overview, major business strategies adopted and SWOT analysis. The key players profiled in the global smart home as a service market include AT&T Inc., CenturyLink, Inc., Charter Communications (TWC), Comcast Corporation, Frontpoint Security Solutions, Ingersoll-Rand plc (Nexia), Johnson Controls, Inc., Protection One Alarm Monitoring, Inc., The ADT Corporation and Vivint, Inc.